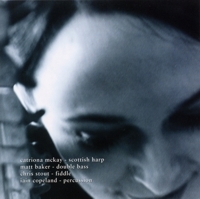 Catriona McKay (Scottish harp) in her Debut Album with Matt Baker (double bass), Chris Stout (fiddle) and Iain Copeland (percussion). a. Da Rusty Tushkar was written by fiddler / guitarist / bassist Andrew Gifford. He wrote it after an incident involving a tushkar (an implement for cutting peat). b. Cliona Cassidy wrote this tune having been inspired by a morning of revelry from the top of the Hill of Tara, Ireland as the sun came up on the new millennium. Cliona is a great friend and is an extraordinary, talented singer and songwriter. b. Miss Betsy Robertson - trad. c. An gille dubh, mo laocham (My black haired wee boy) - trad. A strathspey and a couple of reels. The Swan was built in Shetland and launched on 3 May 1900. Chris Stout, Andrew Gifford and I were lucky enough to be among the musicians / crew onboard the Swan during the Cutty Sark Tall Ships Race 1999. After a great send off in Lerwick Harbour we had to motor south as there was no wind. However, as we reached Sumburgh Head the wind picked up, the motor was stopped, the sails put up and it was a perfect time for tunes on deck. This tune is about that poignant moment. a. Mak a Kishie Needle, Dye - Shetland trad. a. 'Make a Kishie Needle, Grandad'. A kishie is a straw basket used for carrying peats, they are woven using a needle made of wood. b. Garsted fell asleep when halfway home from a wedding in Fetlar. Whilst asleep he bore witness to a trow's party. Fortunately he could still remember one of the tunes they played when he woke up. Closely retaled to the Norwegian troll, trows reside deep within the hills of Shetland and are renowned fiddlers. There is ongoing research into the lifestyle and music of the trows by a group known as Fiddler's Bid, their findings are so far inconclusive and can be seen by visiting www.fiddlersbid.com. a. Kiss Her Sweetly - Shetland trad. b. More Grog Comin' - Shetland trad. c. Da Tief Upon Da Lum - Shetland trad. This was collected from Arthur O'Neill and published in 1797. The tune is ethereal in quality and no words belonging to it have ever been recovered. Having spent many years attending the O'Carolan International Harp Festival in Keadue, Co. Roscommon, I have developed a strong interest in Turlough O'Carolan and a love of his music. I'll never forget my first meeting with a moose in Loon Mountain, New Hampshire. I just had to write him a tune. a. As a child in Dundee I remeber Jim Craig's voice and melodian when he and my dad Ken would play as 'The Taysiders'. Jim is an inspirational charcter and this tune for his 80th birthday. b. We celebrated the arrival of new year 2002 in Fair Isle whilst hurtling down the road towards a party - on the back of a tractor. c. This tune was written to emind me of the good times spent in Manchester where I studied for two years. Every Monday night involved a trip to The Marble Beer House in Chorlton to have a tune with the fine folks there. Bunting obtained this air at Deel Castle, Ballina, Co. mayo in 1792. A love song - it was first published in 1796.